Purchase the game digitally, or boost the fun with a Starter Pack that includes figures and a Portal of Power. 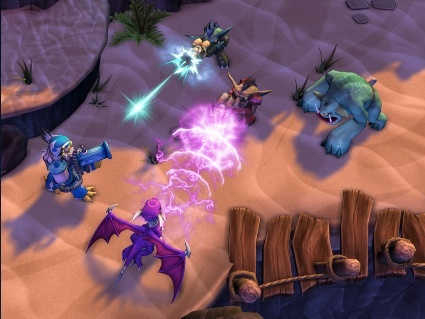 Activision did outstanding work on Skylanders Cloud Patrol and Skylanders Lost Islands, but neither game stopped us from craving a meatier experience on smartphones and tablets. 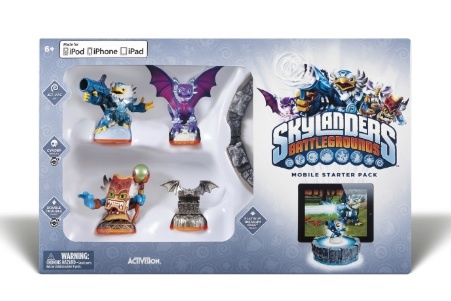 The publisher can apparently read minds, because it came through in a big way with Skylanders Battlegrounds for iPhone and iPad, which resembles the smash hits on Xbox 360, PlayStation 3 and Wii. Available today and built from the ground up for mobile platforms, Battlegrounds features team-up gameplay, which amounts to users controlling two characters at once. Not only that, but there are 20 levels and two mega bosses with more content on the way via updates. That said, you can purchase the game one of two ways. The easiest, by far, is through downloading it on the App Store for $6.99. If you have some extra cash to burn, however, we strongly suggest heading out to the store or just ordering the Skylanders Battlegrounds Starter Pack for $49.99. Inside the box, you'll find a code for the game, a Portal of Power and Skylanders figures. In addition, you can open a platinum treasure chest containing a coin and XP multiplier, health potions and bombs. Of course, this Portal of Power works with all Skylanders figures, and will also interact with Lost Islands and Cloud Patrol. On that note, we'll have a review of Skylanders Battlegrounds next week.